Need a one pot meal that the whole family will love? 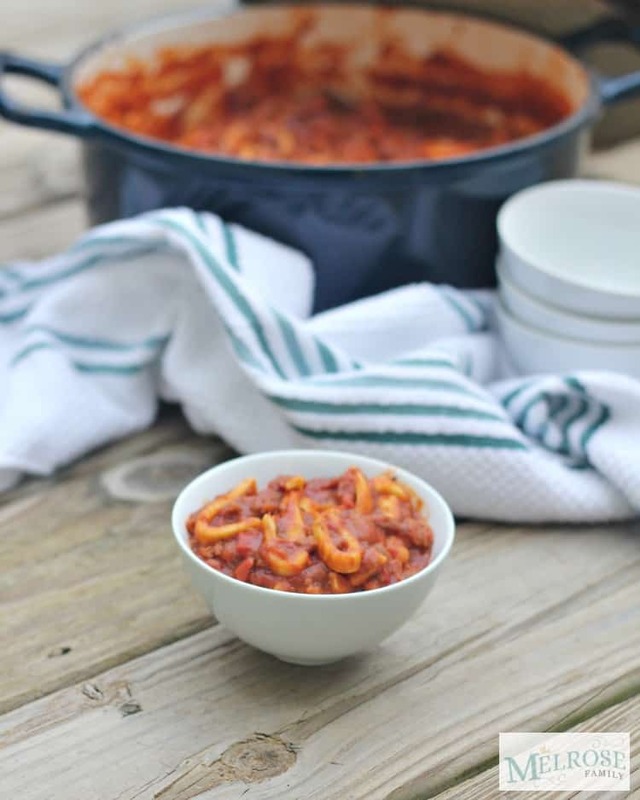 Our One Pot Chili with Noodles is a family friendly recipe that everyone will love. For the longest time we’ve tried to get our girls to eat chili. It is my absolute favorite Sunday dinner. A meal that you can start around the football games and then enjoy while watching the games. Plus, it’s a meal that my husband makes, which means I get to sit back and drink my coffee while he cooks dinner. Those are always some of my favorites meals. There’s just something about football and chili that goes well together. My girls refused to eat it though. That is until now! For some reason my girls couldn’t get past the beans in the chili. If they didn’t notice them, I was convinced that they would like it. So, after loving our Broccoli Sausage Noodle Soup with Reames frozen homestyle egg noodles, I thought to try out the egg noodles in our favorite chili recipe. It was a hit! They both ate full bowls of this one pot chili with noodles. 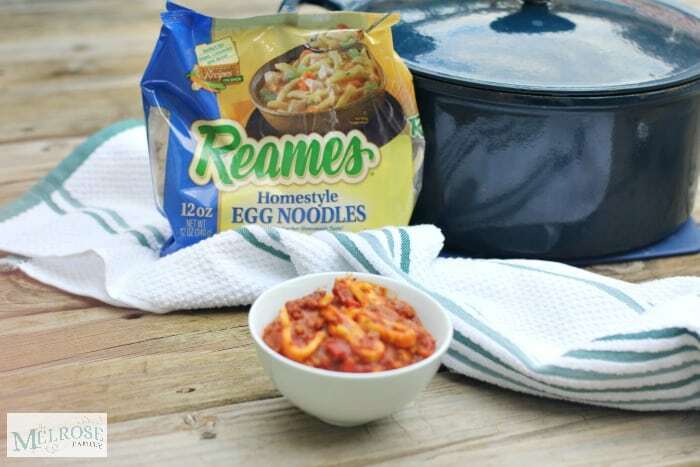 The best part is that Reames homestyle egg noodles are a heartier alternative to dried egg noodles, made with 3 simple ingredients and frozen right after they’re cut. 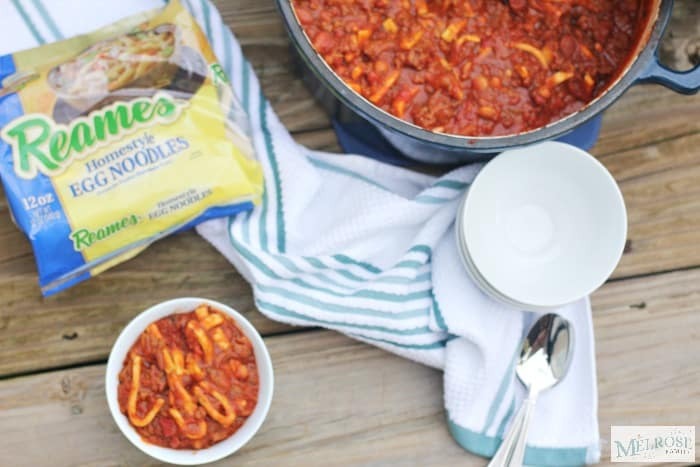 My girls love the homemade texture of the noodles of the noodles and it somehow hides the beans in our chili making this the perfect Fall one pot meal that even my girls will eat. Plus, the noodles keep their texture in the chili, which is unheard of with other dried egg noodles. It’s a win for everyone! This chili with noodles fit the bill for our whole family. I topped mine with sour cream and Fritos and ate mine with a spoon, while the girls ate theirs with a fork so that they could enjoy the noodles by themselves. My youngest was a such a huge fan of the noodles that she asked for a second helping shortly after dinner, but wanted the Reames egg noodles with just butter and Parmesan cheese. Luckily, I grabbed two bags at the store knowing that they were both bound to want more. Reames for the win! Need a one pot meal that the whole family will love? Our One Pot Chili with Noodles is a crowd and kid pleaser. In a large pot brown sausage, ground beef and chopped onion. Drain the grease and add all other ingredients other than the Reames egg noodles. Add Reames Frozen egg noodles and simmer for another hour. I love using them in Fettuccine Alfredo. I love the broccoli sausage egg noodle soup. 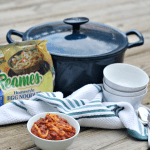 I love these Reames noodles and have used them many times. I love the noodles in my Crock Pot Chicken Noodle Soup. So delicious! I am going to make your One Pot Chili with noodles. Looks yummy! A coworker gave me a great recipe for a casserole with egg noodles, chicken and stuffing. My favorite recipe is using them in soups like chicken noodle soup. Chicken & Noodles is my favorite dish to make with Reames. My favorite recipe to use these noodles in is chicken noodle soup. Egg noodles are delicious! I love to use them in my homemade chicken soup. A good old fashioned chicken and noodle soup! My favorite recipe to make with Reames Homestyle Egg Noodles is homemade chicken noodle soup. I like to make chicken noodle soup. Oh my gosh, my mom has made for years beef stroganoff and will only use these noodles. They are the BEST! I like to make Beef Stroganoff. I love making Chicken Noodle soup with Reames Homestyle Egg Noodles. Beef stroganoff would probably be my favorite. I love to make tuna noodle casserole. My favorite recipe to make is chicken noodle soup! We love a big pot of good ol chicken and egg noodles when the weather gets cold. I make these with a slow cooker recipe using beef and french onion soup. My favorite recipe to make is pasta in a bacon vodka cream sauce – so yummy!